We're fortunate to be able to see eagles in our area. 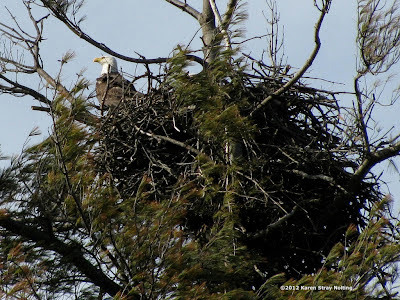 Last year we watched a pair of Bald Eagles raise two chicks in a large nest nearby. But the chicks grew up and the nest has been empty since late last summer. Now several sightings have confirmed that the Bald Eagles have returned to their nest. Our Nature Guide Jon Latimer tells us more. "An adult Bald Eagle in flight is almost impossible to mistake. Bald Eagles are large, dark brown (almost black) birds with brilliant white heads and tails. Juvenile Bald Eagles are as big as adults, but they don't develop the white markings until they are four or five years old. You can distinguish an eagle in flight from a vulture, our other large black bird, by the way it holds its wings. Bald Eagles soar with their wings held flat; vultures hold their wings in a shallow V-shape. "Bald Eagles live up to 30 years in the wild and mate for life. Pairs tend to use the same nest year after year. Their nest or "aerie" is usually built in a large tree near a river or coastline, or in our case overlooking Lake Carnegie. Depending on the shape of the tree branches the nest is built on, it can be cylindrical, conical or disk-shaped. Typically a nest is around 5 feet in diameter, but eagles add new material each year, and nests over 9 feet in diameter have been recorded. "Eagles are territorial during nesting season and will keep other eagles out of their nesting area. The nesting territory usually extends one to two square miles around the nesting site. Bald Eagles also guard their nests against predators, such as crows or gulls, that might try to eat their eggs or chicks. "It takes 35 days for Bald Eagle eggs to incubate. Both males and females tend the eggs, but the female spends the most time on the nest. During incubation, a male Bald Eagle may bring sprigs of green conifer branches to the nest. No one is sure yet why males do this, but it could be for deodorizing the nest or possibly to control pests. "The New Jersey Division of Fish and Wildlife considers Bald Eagles endangered, but the situation is improving. They estimate that there were more than 100 active Bald Eagle nests in New Jersey in 2011, up from only 27 nests in 2001." Last Tuesday (August 21, 2012) my son and I watched (and filmed) two bald eagles taking turns fishing near this site. The first was visible by itself for about 5 minutes between 7.30 and 8.00 a.m. It then rose up and was briefly jojned by the second bird, before it flew away out of sight to the southeast. The second eagle took over the first's fishing spot and remained there for another five minutes before it too departed, this time into tall trees a quarter of a mile from the water.